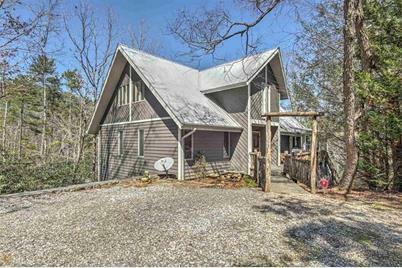 Nestled in a private deep-water cove on the southernmost point of Lake Burton, this 4BR 3BA home is ready to enjoy NOW! Ample outdoor living includes 2-stories of screened porches, alfresco grilling deck, hot tub alcove, & 2-story, 2-stall boathouse with sleeping porch and party deck. Open floor plan features hardwood floors with entertainer's kitchen and massive 2-story stone fireplace. Master bedroom situated off of executive loft; two guest rooms on main; additional living space/bunk room on lower level. New septic system & HVAC. Furnishings & watercraft negotiable. Driving Directions: Take Burton Dam Rd to Burton Mountain Rd. Stay on Burton Mountain Rd for 3/4 of a mile; the pavement will turn to gravel. Drive around the bend. Dee Ln is the first driveway on the right off of Burton Mountain Rd. 39 Dee Ln is the grey house on the left. 39 Dee Lane, Clarkesville, GA 30523 (MLS# 6511536) is a Single Family property with 4 bedrooms and 3 full bathrooms. 39 Dee Lane is currently listed for $1,379,000 and was received on February 20, 2019. Want to learn more about 39 Dee Lane? Do you have questions about finding other Single Family real estate for sale in Clarkesville? You can browse all Clarkesville real estate or contact a Coldwell Banker agent to request more information.